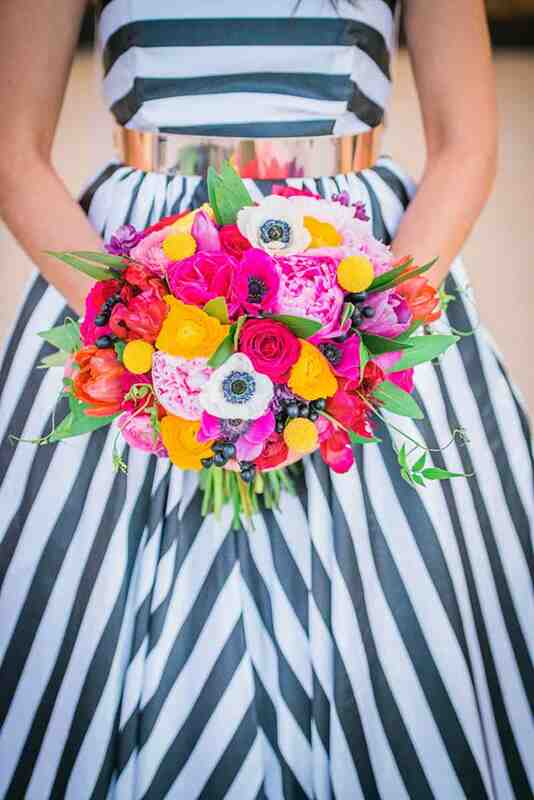 A KATE SPADE-ESQUE STYLED SHOOT WITH A MAGNIFICENT BLACK & WHITE STRIPE DRESS!! Happy Monday Folks! I have been so excited to share this pretty darn awesome shoot with you today! It features the most amazing black and white stripe bridal gown, I can’t even…! Kelly , of Kelly Kennedy Events first envisioned this shoot the minute she laid eyes on this magnificent dress designed by Natalie Harris of Damsel White Label. It screamed to be the center of a polished, sophisticated Kate Spade-esque wedding, she told us. The dress was a unique black and white striped strapless ball gown,with a one-of-a kind fingertip veil, with black edging created exclusively for this shoot. The outfit was pulled together with a rose gold belt to give the dress a sophisticated yet glamorous vibe and adorned with beautiful pearl and swarovski pieces designed and created exclusively by Amanda Badgley Designs. Striking Stems draped the Ceremony site with beautiful ivory sheers and then created a unique flower chandelier using beautiful blooms in bold colors which hung above bride and groom, whilst the bouquet was hand tied with peonies, anemones , and billy balls. The florals were a bold contrast to the dramatic dress, establishing a unique yet modern twist. This was emphasised with gold sequin linens, beautiful glass plates, hand stamped “bride and groom” forks and “mismatched” chargers. To round off the Kate Spade theme, we also featured a 4 tier fondant cake with gold polka dots black stripes, hand painted flowers, fondant pearl accents, and hand crafted sugar peonies, surrounded by dessert shooters filled with whip cream and strawberries. The flowers are insane!!!!!!! So bold and I am obsessed with the flower chandelier and the bride’s bouquet!!!!!! The DRESS is fabulous and called for the right flowers…..Striking Stems knew just what it would take for a perfect marriage of dress and venue! Kudos girls!